Republished 10:00 a.m. November 28 to correct the map legend. Shikoku Electric Power Co. restarted the 890 megawatt (MW) Ikata-3 reactor in Japan's Ehime Prefecture at the end of October, the fifth nuclear reactor in Japan to be restarted in 2018. 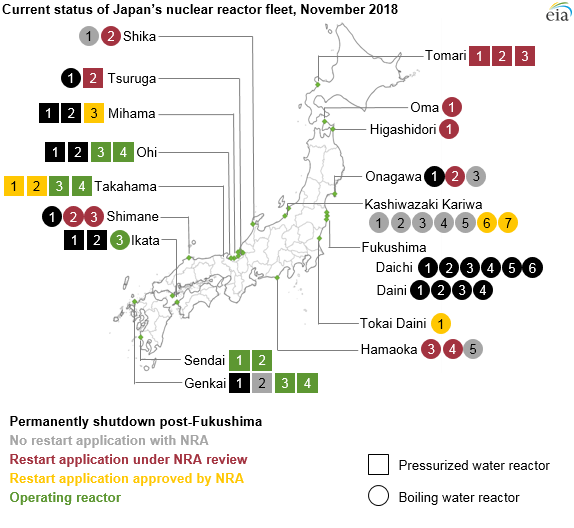 Japan had suspended its nuclear fleet in 2013 for mandatory safety checks and upgrades following the 2011 Fukushima accident, and before 2018 only four reactors had been restarted. Following the Fukushima accident, as each Japanese nuclear reactor entered its scheduled maintenance and refueling outage, it was not returned to operation. Between September 2013 and August 2015, Japan's entire reactor fleet was suspended from operation, leaving the country with no nuclear generation. Sendai Units 1 and 2, in Japan's Kagoshima Prefecture, were the first reactors to be restarted in August and October 2015, respectively. The restart of Japan's nuclear power plants requires the approval of both Japan's Nuclear Regulation Authority(NRA) and the central government, as well as consent from the governments of local prefectures. In July 2013, the NRA issued more stringent safety regulations to address issues dealing with tsunamis and seismic events, complete loss of station power, and emergency preparedness. Before a nuclear operator can resume electricity generation, it must apply for permission to restart the reactor. The NRA reviews the restart application and inspects the reactor, potentially requiring the operator to make safety upgrades and complete another inspection. The suspension of Japan's nuclear fleet resulted in significantly greater dependence on liquefied natural gas (LNG), oil, and coal imports to make up for lost domestic nuclear generation. Japan has limited domestic energy resourcesand imports virtually all of the fossil fuels it uses. Therefore, Japan is the world's largest importer of LNG and the third-largest importer of coal, behind India and China. In 2017, natural gas accounted for nearly 37% of Japan's electricity generation, followed by coal at 33%. LNG and coal imports rose last year as court injunctions delayed the planned restart of some nuclear reactors. Japan's utilities spent approximately $30 billion each year for additional fossil fuel imports in the three years following the Fukushima accident. As part of Japan's long-term energy policy, issued in April 2014, the central government called for the nuclear share of total electricity generation to reach 20%–22% by 2030, which would require 25 to 30 reactors to be in operation by then. 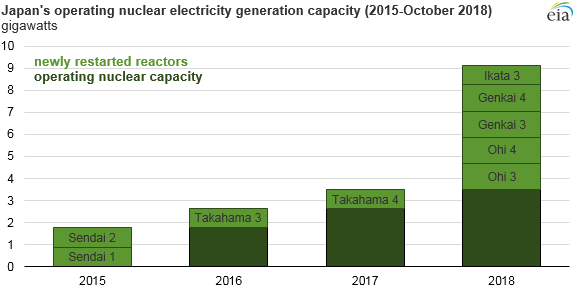 In 2017, four operating nuclear reactors provided 3% of Japan's total electricity generation. Twenty nuclear reactors in Japan have permanently retired in the wake of the Fukushima accident. Out of the remaining fleet of 34 operable reactors, 9 are currently operating. Six others have received initial approval from the NRA, and another 12 units are under review. Nine reactors have yet to file a restart application.